Monitor the web, social media, forums, and blogs to learn more about your brand and your industry. Track online conversations as they happen, wherever they happen. 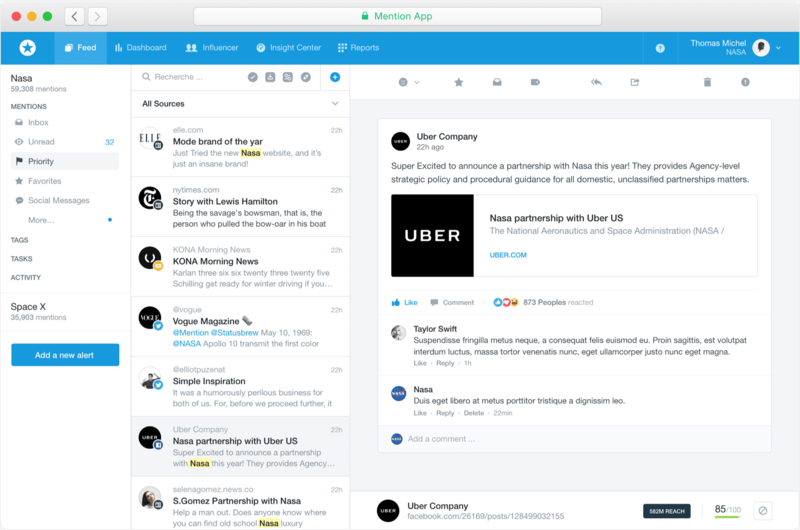 No more scouring the web manually, or waiting for your weekly mentions digest. You know what's said, now. Mention tracks every major social network, plus blogs, forums, news, and review sites. Build your brand online by finding meaningful conversations to be a part of. Reach out, respond to comments in real time, and grow your community of brand ambassadors. Our influencer discovery tools help you find powerful voices to work with and spread your message. Get hands-on training and support from our media monitoring experts. From onboarding through to execution, our services are available at no charge. With so many conversations online, it can feel impossible to keep up with it all. Media monitoring lets you collect all these mentions, to analyze when you have time. Our advanced Boolean alerts help you narrow down to only the results that really matter to you. Creating reports can be a thankless, time-consuming task. Instead, let Mention send live, up-to-date reports to any email address in the world. Our automated reports display your monitoring data your way, with your logo. Know what people say about your brand and your industry. Monitor your competitors' mentions, campaigns, and clients. Learn quickly when bad news breaks, and respond immediately. See how Mention supports its public relations and communications on both social media and the web, and helps the Opera maintain its classic brand with modern marketing strategy. Get the tool that lets you listen, analyze, and react to everything. Leading companies worldwide use Mention to build and protect their brand.